As we look forward to the New Year it is always a healthy act to look back and reflect on the happenings of the past year. As a blogger it is interesting and enlightening to review what I wrote and what resonated with people on our blog as they searched for information, resources or advice. Here are our Top Ten Live Vibrant blogs for 2018. Enjoy and share! 6. Guest Blog: Turning 50 after Gastric By-pass Surgery—Happy Healthy Birthday to Me! 7. Carrot Hummus with Turmeric—Bright and Flavorful! It is an extraordinary journey we are all on looking for ways to embrace a healthier lifestyle in order to live life as our healthiest selves. Livliga and our Live Vibrant blog are committed to supporting you on this journey. Here’s to a Happy and Healthy 2019! Not sure where to start? Macaroni and cheese is one of those classic comfort foods. When the weather is cooler or we just need a cozy meal to feed our soul, this is a classic go-to. The challenge is the recipe for Mac & Cheese is traditionally loaded with carbs and calories. My quest was to figure out how to offer a lower carb and lower calorie version of this classic that could qualify as diabetes-friendly, kid-friendly and gluten free. A tall order. To be considered diabetes-friendly I wanted to have the overall carb count 45 grams or lower. This recipe came out at 44.25 grams. To make it creamy and thick without adding flour I used butternut squash and Greek yogurt. Below is my new version of Macaroni and Cheese that met the necessary requirements AND the thumbs up from my family. Preheat oven to 375°. Put water on to boil for cooking the pasta. Combine squash, broth, milk and garlic in a medium saucepan. Bring to a boil over medium-high heat. Reduce heat to medium and simmer until squash is tender when pierced with a fork, about 20 minutes. Remove from heat. Place the squash mixture in a blender. Add salt, pepper, and Greek yogurt. Remove the center cap in the blender lid to allow the steam to escape. Blend until smooth. Place blended mixture in a bowl. Stir in the Gruyere, Romano and 2 tablespoons of Parmesan. Stir until combined. Cook pasta according to the package directions omitting any salt or fat. Once cooked, drain well. Add pasta to the squash mixture. Spread the mixture evenly into a 13 x 9-inch glass or ceramic baking dish coated with cooking spray. Sprinkle top with remaining 2 tablespoons of Parmesan. Bake at 375° for 20 minutes or until bubbly. Next turn on the broiler for 5 minutes to brown the top a nice golden color. Still Time for Holiday Delivery - Our One Day FLASH SALE! Today is the day! Don't miss out on our ONE DAY flash sale! Get FREE shipping on all purchases today. And don't forget to take advantage of our AMAZING "today only!" 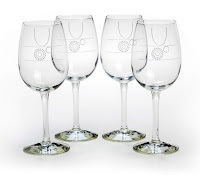 pricing on our 16 piece dinnerware sets. All of this AND we'll make sure it get's to you in time for Christmas (ground delivery)! It's the perfect time to save AND give the gift of health! Maybe you have a baker in the family? If so, our LivSpoons are an amazing addition to any kitchen. Not convinced? Learn from our customers why they're the best! Perhaps there's one person in your family who is regularly hosting the rest of the family for dinner parties or holidays? We have lots of options for them too! We have a fabulous serving bowl (that goes well with the LivSpoons), and full dinner sets to help keep everyone in the family healthy, and even fabulous glassware for everyone to use! Labels: Holiday Insights, Livliga Special Event, Sale! Livliga product is unique. We often point out that our products have three utility patents. What is less known are the awards and recognition we have received because of our unique, innovative, and stylish designs. We currently have three awards to share. We were thrilled to receive the Best New Product designation for our LivSpoon®. 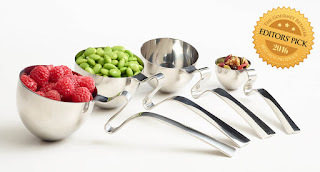 As they said…”We picked it because: Measuring spoons that double as attention getting serving spoons…creates a world where portion control…just got a whole lot more fun”. 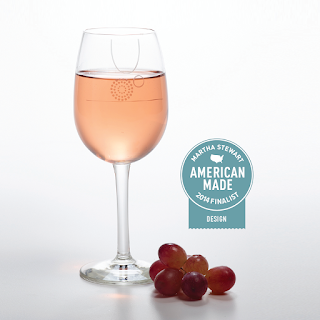 Livliga was recognized as a finalist in design for our American-made Aveq wine glass. To be picked as a Finalist among thousands of products submitted for consideration and then judged as part of the Martha Stewart’s American Made nationally recognized awards program, celebrating rising stars of the growing maker culture, is a dream come true. To have this health and wellness company be recognized for its design is indeed an honor. It takes a team to create a nationally recognized children’s book. 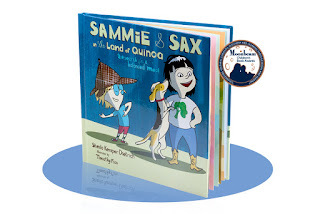 Sammie & Sax in the Land of Quinoa: the Search for a Balanced Meal is an original book with illustrations that helps kids learn about a balanced meal, eating healthy, and how to do it as a family. To have this first book, of a series to be written, recognized among multi-thousands of entries is truly humbling. The adventure book is given to every child that receives a set of Kidliga dishware and can also be bought separately. Now this special book has been translated into Spanish. The book is available both in hard back, in English, and electronically, in Spanish. This is part of the Livliga dream to be available to all ages and accessible to everyone.